Welcome to our watch review site! You've made the right choice to visit. I have done my homework and extensively researched this year's watch selection. The watches I review here start at under $100 and then include some luxury pieces, but all are unbeatable values. Let me give you some ideas and suggestions on current styles and trends. If you find what you're after, go for it! It could be for yourself, a special someone, for graduation, a birthday, holiday, or for no special reason at all! Following the table summary of models included here, you'll find my more detailed reviews. If you see a watch here that you like and want more information, simply take a look at the full lineup. Designed for challenging environments. 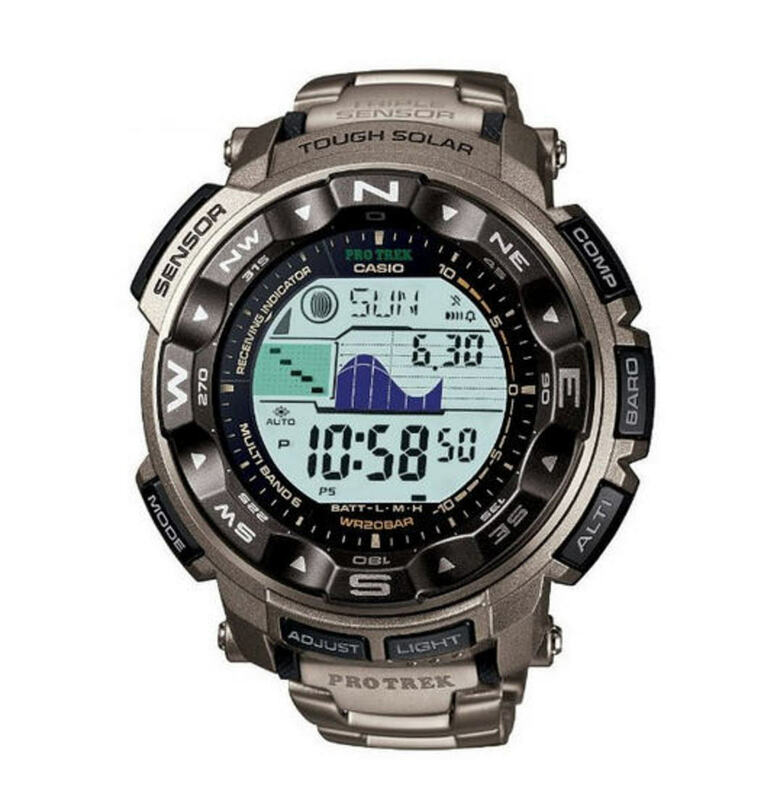 Includes altimeter, barometer, compass, and thermometer. Smartphone features including phone, text, and email; 1.63-inch screen. Scratch-resistant sapphire-coated dial window. Water resistant to 660 feet. Waterproof, shock proof, multi-function. Great for outdoor activities. Connects to device via Bluetooth. Easy access to split and lap times as well as workout logs. Rugged outdoors watch. Designed for skindiving. Water resistant to 1,000 feet. Canteen style screw-top crown and chain. Deep cobalt blue face; water resistant to 330 feet. Since I review watches maybe you're asking, what do I wear on my wrist? I have a TAG and a Citizen, but as a newbie collector I want them all! I think having variety and different materials when it comes to wearing a timepiece is essential for today's world. When buying a men's watch, there are many things to consider. Honestly, most men should probably own at least three watches. But the truth is, most men prefer one watch and will wear it regardless of what they're doing. I am a professional that works in a corporate office building. I own a watch that is thin and blends into my outfit for the day. When I take my wife out to dinner, I put on a flashier watch that says something about my personality. On the weekend, I wear a throw-around kind of watch. One that doesn't matter if I bang it against the lawnmower or take it into a pool. Not to say you can't get a quality watch without breaking the bank, but it's important to realize that for anything with some substance of quality, you're going to have to spend at least a few hundred dollars. Don't be fooled by "nice looking" watches that are extremely cheap. They are junk and will not last. You can get a decent quality watch for well under $500. Watches sell for every price imaginable. You just have to decide where you stand. Do you like a leather band? How about a metal bracelet? Is gold your style, or stainless steel? Are you looking for a jeweled inner working 12-diamond face, or will a simple white dial do the job? Leather bands are great. They can be formal or informal. Jewels are going to be flashy and should be contained to watches that you want to show off and flaunt yourself. White and blacks simple faces are conservative, while gold is traditional. Is this an investment piece? For most of us, the answer is no. Some watches however, do go up in value. 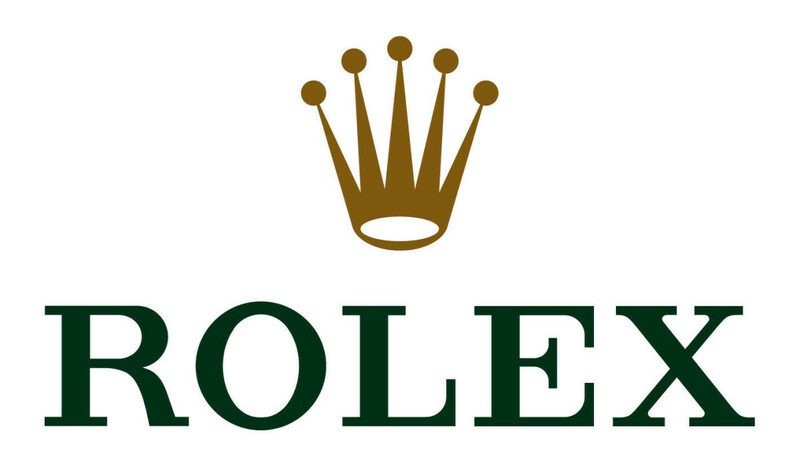 For example, it's common that a well-cared-for Rolex Daytona will hold its own and increase in value over time. On the other hand, if you're watch isn't collectible or rare, simply take care of it and know that it can last a lifetime. Perhaps it will be something you hand down to a family member or use the rest of your life. Am I looking for a universal watch, or several depending on the situation? I talked about my personal situation above, but you must ask yourself this question. If you're looking for a single watch, I would recommend something conservative, yet fun. Perhaps a TAG Heuer. They are incredibly well-built, timelessly styled, and are in the middle-of-the-road when it comes to price. I would choose a dial color that suits you and stick with stainless steel links. If that's not your style, but you still want a single watch, I would go for a nice brown leather banded watch. Anything else is so situationally specific that it's hard to wear it in any setting. Are you flashy? Conservative? Outdoorsy? Cube dweller? Whatever your style, pick a watch that compliments it. Watches should be practical. A nightclub owner wearing a calculator watch simply will not do. You get my drift. Whatever your style, always comparison shop when choosing a watch. Personally, I'm a big Amazon shopper. There is almost any watch conceivable there, most backed by full warranties and easily returnable. What I like most is that there is no tax and shipping is generally is free or inexpensive. Introducing the new Pro Trek PRW2500, a high-performance tool developed under the supervision of meteorologists to take on challenging environments. Like all triple sensor Pro Trek models, the PRW2500 features easy-one-touch operation of its altimeter/barometer, compass, and thermometer. A reconfigured duplex LCD provides optimal layout for information at-a-glance when you're on the go. In addition to numerical and trend graph data, unique arrow icons help to indicate characteristic barometric pressure patterns. Water resistance to 200 meters improves performance while river trekking and rafting where one would encounter strong water pressure. The addition of tide and moon graph/data provides convenient information for sea kayaking and fishing. Titanium band digital watch with black face. I have read all the reviews and thought what the heck. I bought this watch and was very pleased with my purchase. There are a lot of negative reviews that say "I wish it could do this or I wish it can do that." I wish it could take out the trash for me too, but I guess I will just have to settle for the most advanced watch ever! TAG Heuer Formula 1 Professional. Ideal for casual attire, this TAG Heuer Men's Formula 1 Professional timepiece is a great choice for athletes thanks to the sporty titanium uni-directional bezel printed with large, silver-tone Arabic numerals in increments of five. Its impressive scratch-resistant sapphire-coated dial window reveals a black dial with silver-tone hour indicators, small minute indexes, and luminescent silver-tone hands. This watch also offers a triple-link stainless steel bracelet, date window at 3 o'clock, precise Swiss quartz movement, and water resistance to 200 meters (660 feet), which means it will stand up to the rigors of recreational scuba diving. This is the most popular TAG on the market today. It's priced exceptionally well and is one of the longest running collections in the TAG family. You are sure to be a hit with this stylish, high quality piece from our friends at TAG. 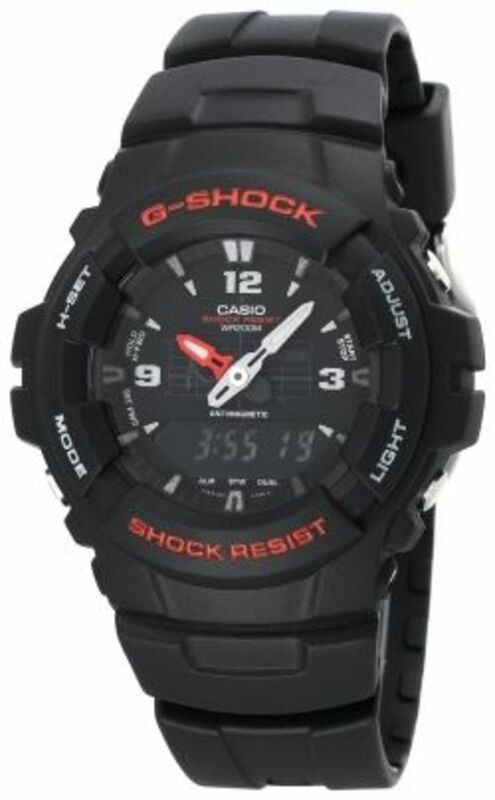 What's not to like about a $70 waterproof, shockproof, multi-function watch that also looks good. It's a seriously rugged-looking watch but very light-weight. An inset digital screen is controlled by a mode button that advances through the date, digital time, alarm time, stopwatch, and second time-zone functions. The screen can be back lit in a cool (really) blue light for night viewing. 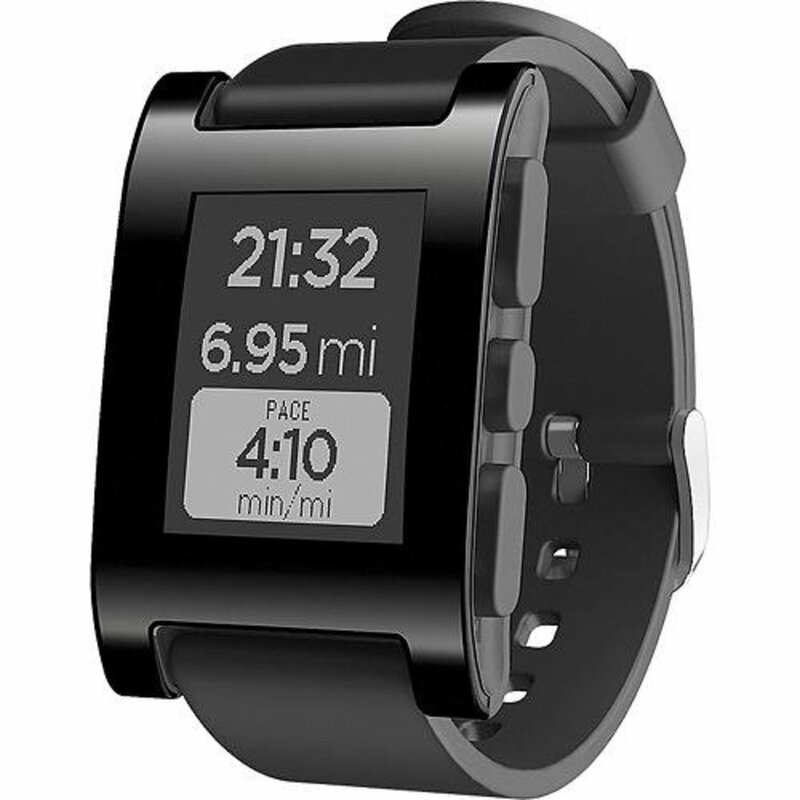 The Pebble Smartwatch connects to your iPhone or Android device via Bluetooth, so you get the information you need exactly when you need it. Designed to make your life easier, Pebble provides personalized notifications and downloadable apps to keep you in the loop when you're on the go. 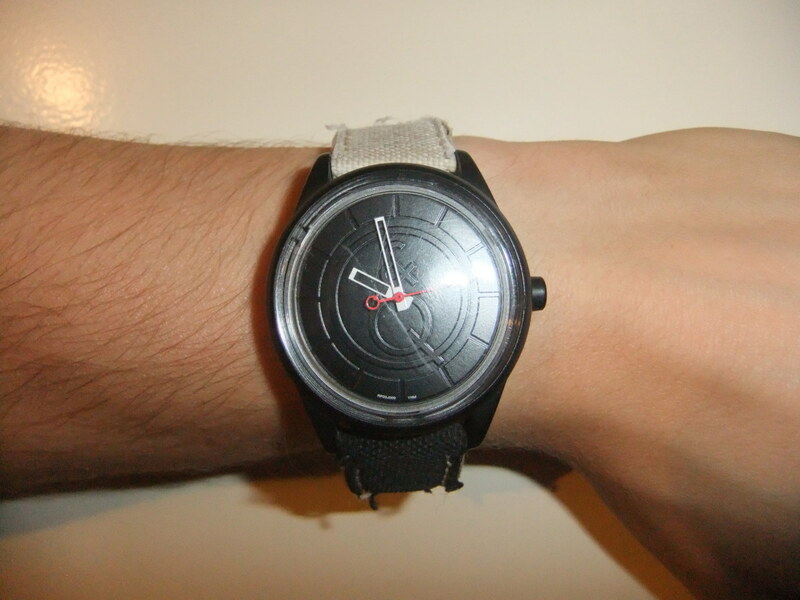 You can also customize with watch faces and apps to suit your personal style and interests. It features a long-lasting battery, user-friendly operation, and a screen that's readable even in bright daylight or underwater. Pebble comes with a USB charging cable and Quick Start Guide. This watch is great! I love being able to try different watch faces every day. There is an app so that I can even create my own watch face. So I did. It was easy to load it on an use it. I added it to the others on my Pebble. I'm hard of hearing. Normally I need to have my phone on a loud setting to hear it even with my hearing aids, and sometimes I don't feel the vibrating alert on my phone. Other times I have my phone in the bedroom because I don't have it with me. Nevertheless, my Pebble will vibrate and tell me who is calling. Even 30 feet away. It is totally awesome. If I want to ignore the call I just click the button on the watch. For those of you that don't like the Pebble because they think that it looks cheap, all of my watches (except the one that I use to work in the yard) prior to this one were fancy $500+. I now wear my Pebble everywhere. I meet with executives, and often I'll show it to them and next thing they want to know what it costs and where to get it. I also wear my Pebble running and occasionally in the shower or bath. Never a problem. 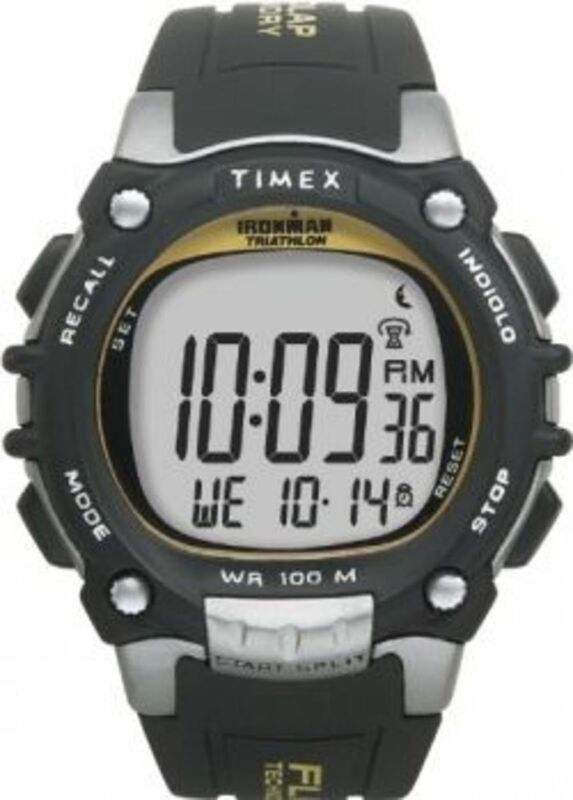 Timex Ironman 100-Lap FlIX System. It incorporates the Timex Flix system, which activates the Indiglo night-light with a simple flick of your wrist. To activate FLIX, put the watch into Night-Mode by pressing and holding the Indiglo night-light button three seconds until it beeps. With the watch in night-mode, a forward "flick" of the wrist with a sharp "stop" will activate the Indiglo night-light for three seconds. Are you an outdoorsman? If so, this is the watch for you. There is nothing you can't do in this piece, from fishing the salty waters of Alaska to hunting birds in East Texas swamps. This watch will keep your head in check and time crisp. You will love it. Omega Seamaster "James Bond" Blue Dial. The Omega Men's Seamaster Blue Dial Watch makes its statement with a sporty deep blue dial with luminous hands and hour markers and a calendar window that sits at the 3 o'clock. This timepiece also features quartz precision movement with rhodium-plated finish for greater precision, stability, and durability of the movement, a stainless steel case and bezel, and a stainless steel band. The blue bezel is offset with white markers and Arabic numerals. The watch also features a domed, scratch-resistant sapphire crystal coated on the inside with anti-reflective treatment, and a calendar window at the 3 o'clock. 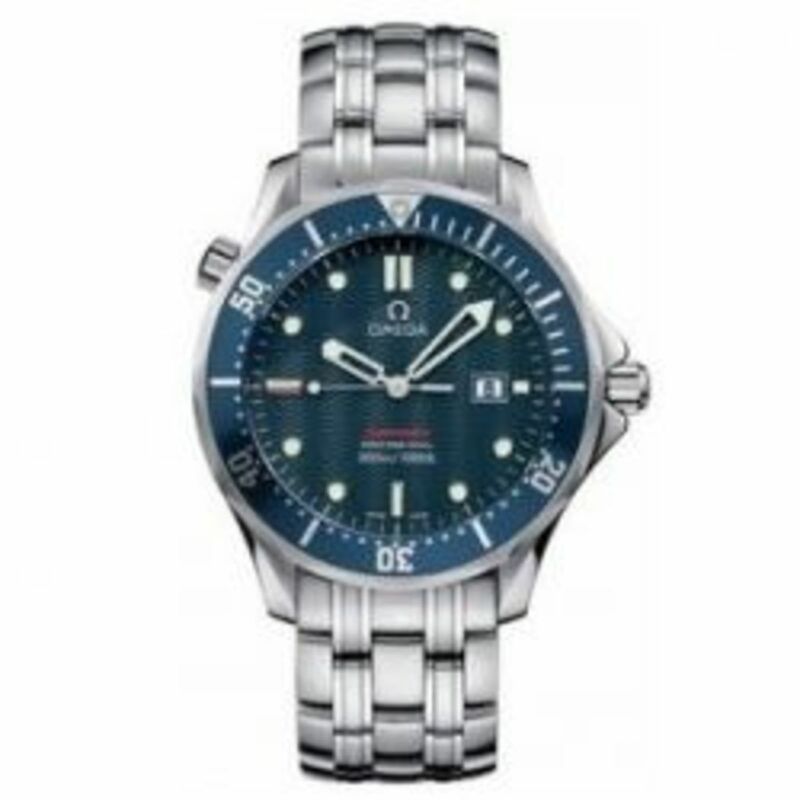 Designed for skin diving and other water sports, the Seamaster is water resistant to 1,000 feet. 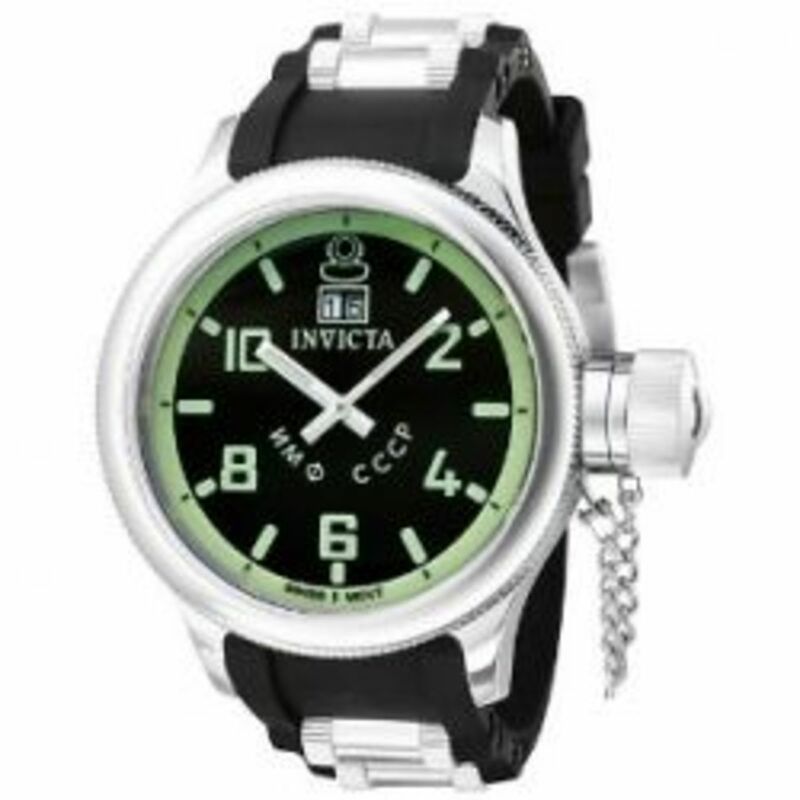 The Russian Diver Watch by Invicta is a powerful black and silver timepiece done in a canteen style, with a screw-cap crown and chain. The luminous hands and indexes make it easy to read the time, and the adjustable buckle on the comfy band make for a good fit. Featuring large Arabic numbers and a convenient date display just under 12 o'clock, the grand 52 millimeter stainless steel case frames the black dial with the notable Russian Diver logo in place of 12 o'clock. Water resistant to 330 feet, this eye-catcher will have people noticing, especially when paired with jeans and a T-shirt. Bulova Marine Star Mechanical Hand-Wind Automatic. 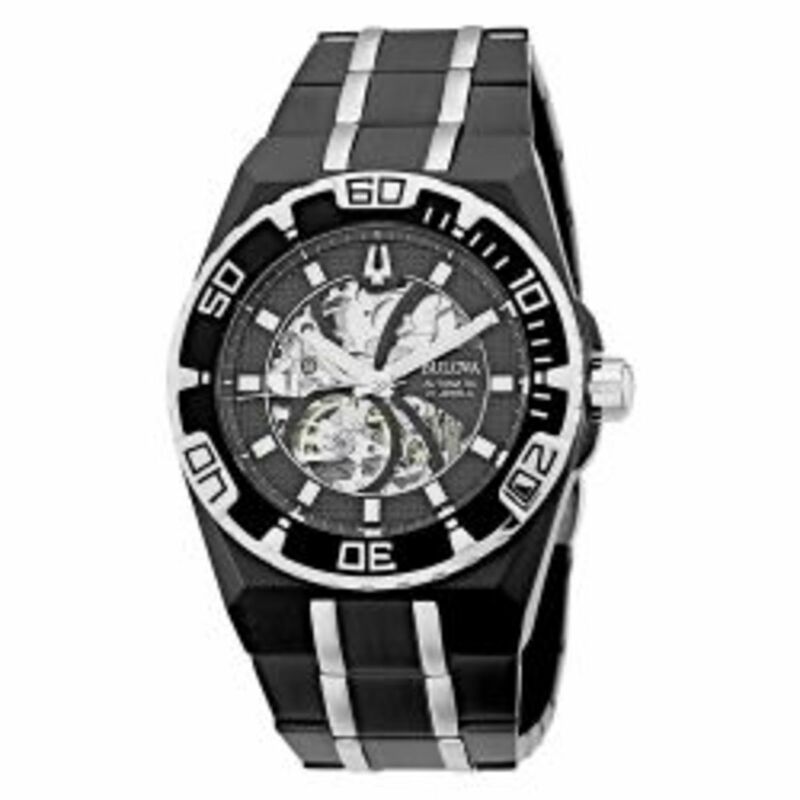 The Bulova Men's Marine Star Mechanical Hand-Wind Automatic watch's black-and-silver-tone stainless steel band lends a sporty feel to this fine, automatic watch. 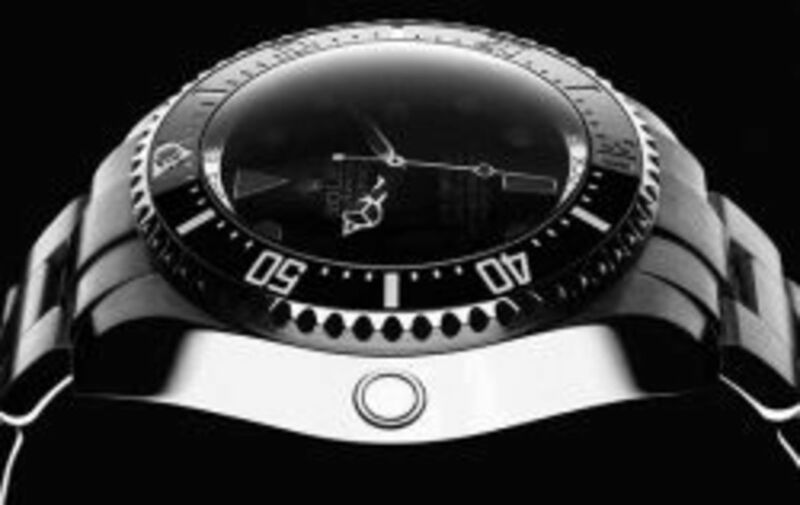 A stainless steel case is topped by a black, coin-edge bezel. Silver-tone-and-white bezel details feature Arabic numeral and stick minute markers. A black dial offers cut-outs that form a pinwheel design to reveal the working gears of this handsome automatic timepiece. Luminescent hands and square hour indicators, as well as white stick minute markers, round out the dial. 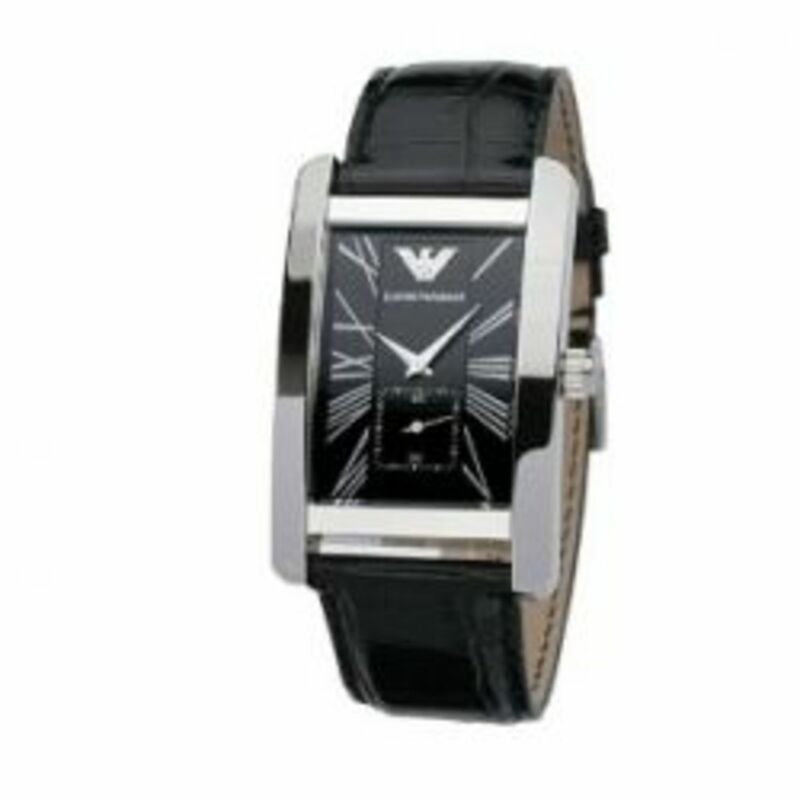 This automatic watch presents in a Bulova gift box and is water resistant to 330 feet (100 M). This is a gorgeous piece boasting unique color combination, while maintaining classic standards. I absolutely love this watch. I have worn it personally for a week while reviewing it. The weight, style, and quality makes me feel incredible while showing it off. You will enjoy it, no doubt. 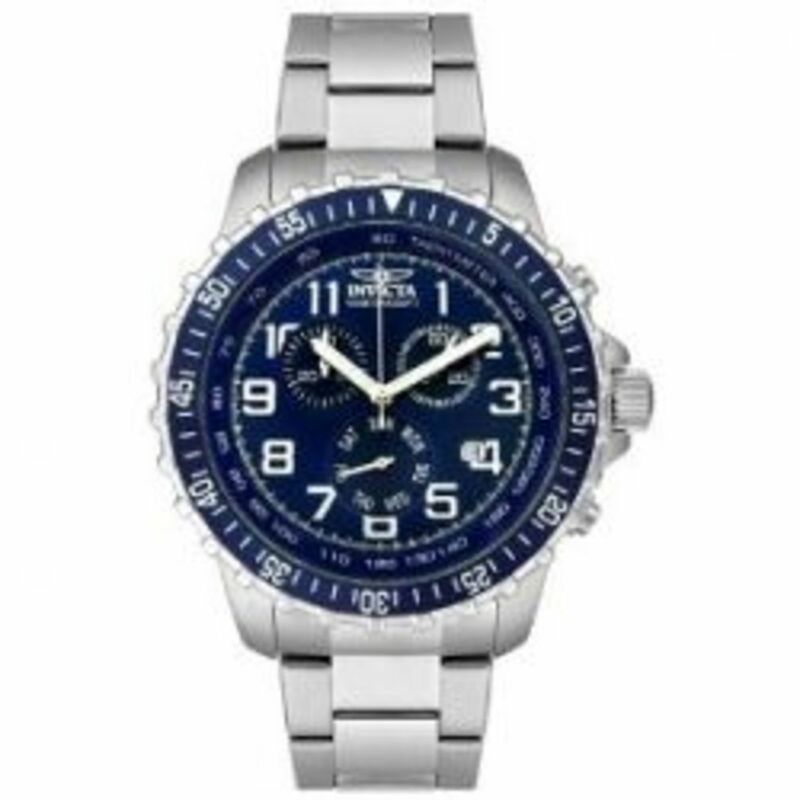 Invicta Men's II Collection Chronograph Stainless Steel Blue Dial. With its bold stainless steel case and stylish band, the Invicta Men's II Collection Chronograph stainless steel blue dial watch exudes attitude and experience. The watch's unidirectional segmented bezel features engraved white numbers in five minute increments, which nicely complement the deep cobalt tone of the dial. Bordered by an elegant tachymeter, the dial displays hour indicators in bright white Arabic numerals, as well as hatched minute markers. The face also features subdials with 60-second, 30-minute, and day-of-the-week functions. Luminescent arrow hands, a date window at four o'clock, and the esteemed Invicta logo round out this automatic timepiece. This watch arrives in a handsome yellow Invicta gift box and is water resistant to 330 feet. 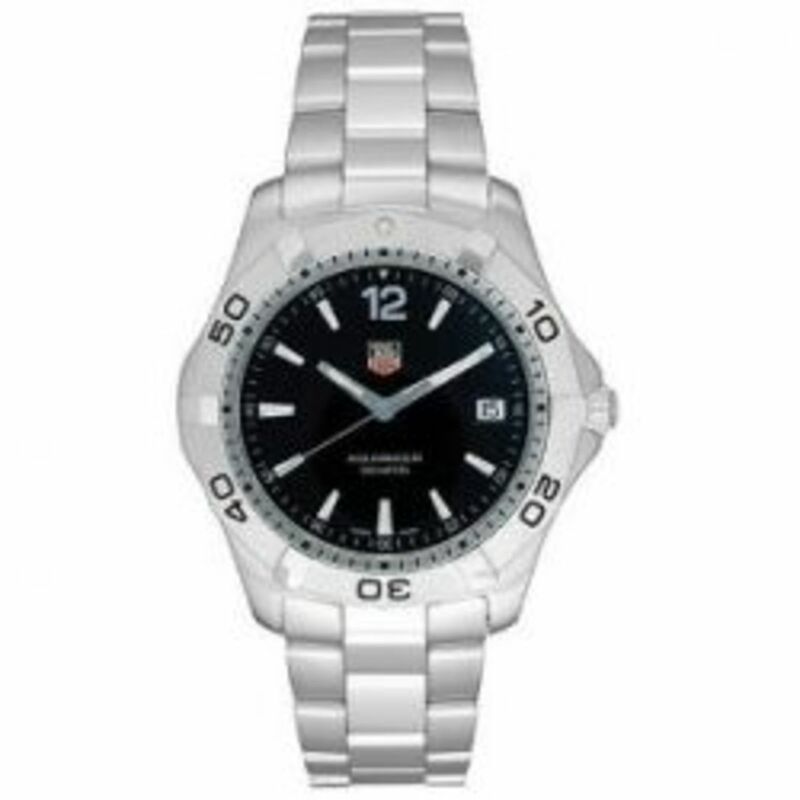 This might just be the watch you've been looking for and they are usually low in stock. Citizen Eco-Drive Perpetual Calendar Chronograph. Designed to meet the demanding criteria of professional divers, this durable and sporty watch combines precise timekeeping technology with TAG Heuer's signature prestige styling. The 41 mm brushed steel case highlights a silver dial with a full-color TAG Heuer logo and an automatic date calendar at the 4:30 position. Blue chronograph subdials at 2 and 10 o'clock display the 1/10 second counter and 12-hour counter respectively, and an additional subdial at 6 o'clock registers the seconds. Luminous hands and hour markers, a chronograph seconds hand, and a red chronograph minute hand with an arrow tip are all designed for optimal radiance and readability. The dial is framed by a unidirectional rotating bezel with an Arabic numeral scale for timing dives and other limited events. The watch presents on a handsome and brushed and polished steel link bracelet that features a double safety clasp and an extension system for divers. TAG makes one of the highest quality watches on the market today. This is the exact watch I own and wish it could be yours also. Presenting a classic design fused with fresh details, this Skagen Men's Titanium Watch features a dramatic black dial face, encased by a mineral dial window for extra protection. For your time-telling convenience, white Arabic numerals bring a stand-out contrast, an additional ring of Arabic numerals provide a 24-hour clock, and a handy date calendar rests at the six o'clock position. A black titanium band comes equipped with a sturdy fold-over-clasp-with-safety closure, and both the bezel and 39-millimeter case are made of ultra-durable titanium. The perfect accessory for work or for play, this striking timepiece showcases your refined taste. Powered by Japanese quartz movement, this watch is water resistant up to 99 feet and is protected by a limited-lifetime manufacturer's warranty. Are you conservative and stylish? Do you like pieces that are subtle yet refined? You may have just found your piece. 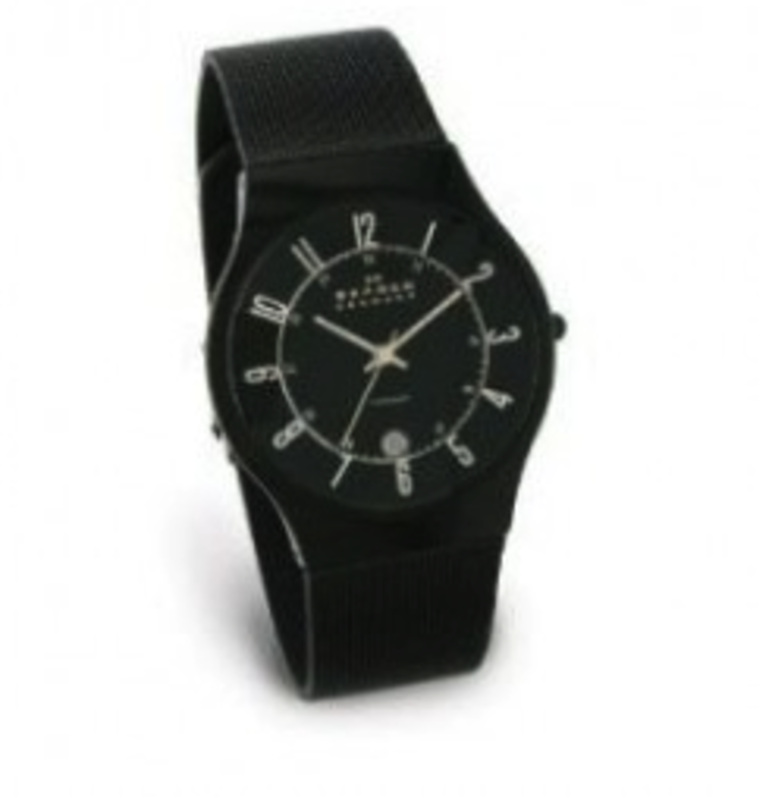 The highest quality materials go into this Skagen and it shows in every way. Truly striking. The Invicta Venom is my preferred line, but this hub is great. I am a big fan of Invicta Grand Diver Automatic Watches, They look and feel nice, well constructed and affordably low cost for the kind of workmanships and quality. Undoubtedly, very good value for money in this watch collection. 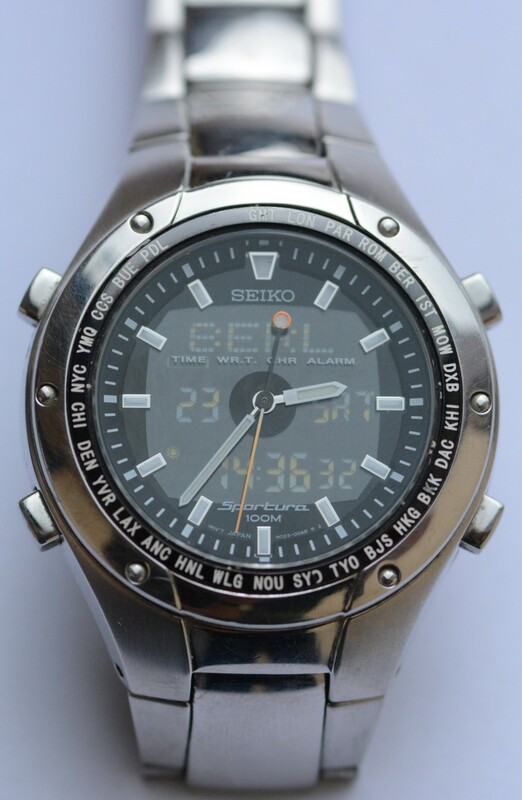 A good collection of watches with useful information on each, thanks for sharing. I like the very first picture you have at the opening paragraph near the big W. Can you please let me know which one is that? What are your thoughts on the RADO collection? Nice selection. Great gift ideas! No Casio? :(However nice collection. Nice selection of mens Watches. Bulova ~ Precisionist ~ So beautiful...I am an intermediate collector and have started to dwindle my selectivenes to simpler face designs. I have a few watches with all of the dials and whistles and they are beautiful too...But ever since buying my first Bulova a few weeks ago that had a very elegant simple face I am caught in a tailspin of sorts in this area. The new Bulova Precisionist I just purchased is the dual gold and silver face with the very nice sweeping second hand...Love it. i really liked this. great info! especially for me that love watches. 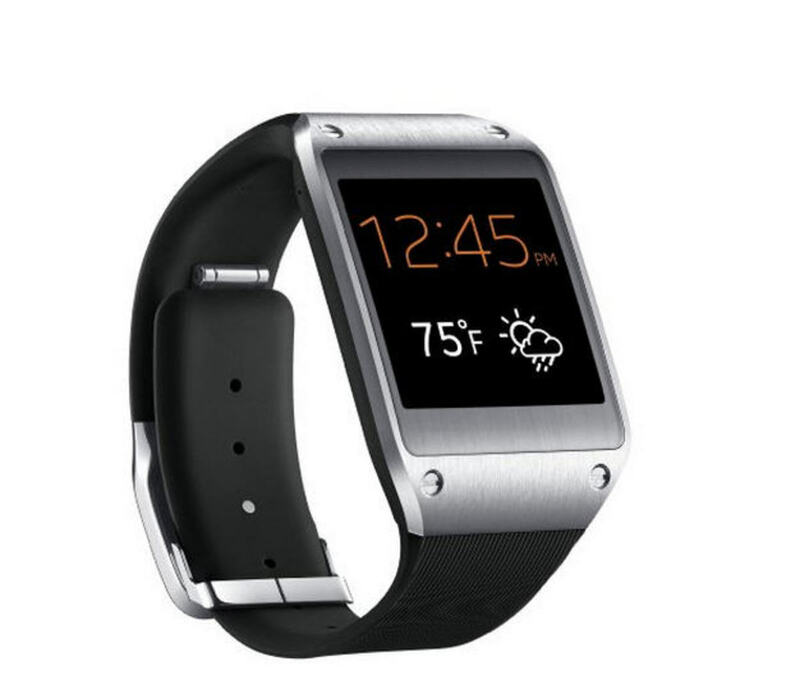 I really don't like the leather band style - is that still in? Some nice watches aside from that, though. Great lens. I like the round and silver style watch like the TAG featured here. Good Len, I think TAG and Citizen are not too bad to with. awesome lens! I haven't worn a watch in years! Great choices here to buy one again! Cool lens, thanks for the information, one can never have to many watches! I'm a big fan on the Aqua Master watch. Definitely on my list for the holidays next year! these watches look so professional, thanks! I love IWC but can not afford one with 4 kids. maybe a retirement gift to myself someday. I love watches`as well. 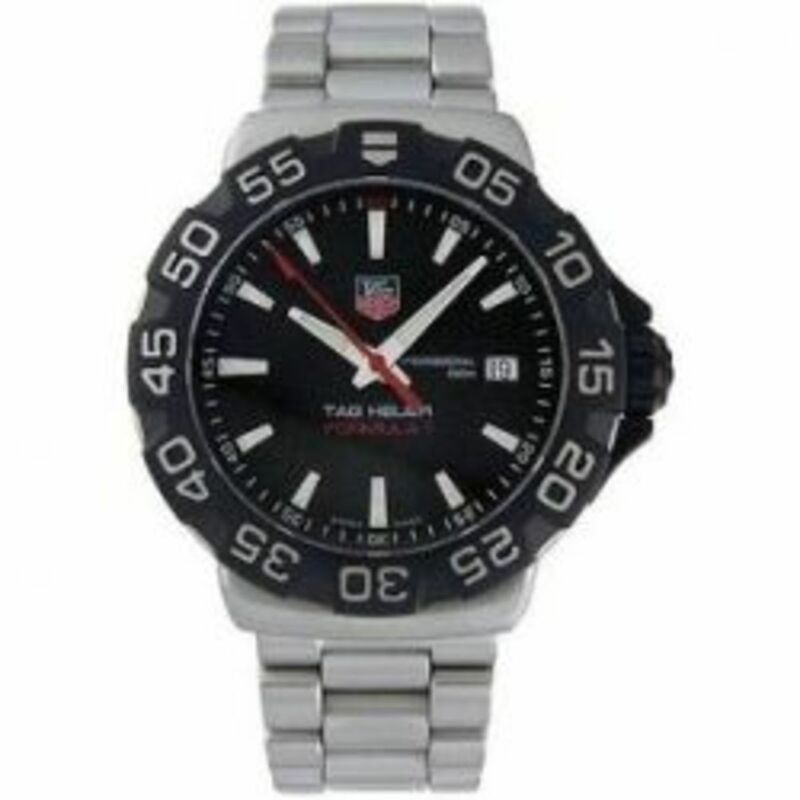 It is hard to find watches for $100.00 or less. I have a few watches in this price range at www.jenagio.com. Good luck in your watch finding pursuit. Bought my first Tag from you - It's PERFECT thank you!! !